ACC’s researcher Liza Cirolia co-authored Urban infrastructure and development with Philipp Rode, Executive Director of LSE Cities and Associate Professorial Research Fellow at the London School of Economics and Political Science as part of LSE Cities Working Paper series on Urban Governance and Institutional Frameworks. Over the last decades there has been a revival of interest in understanding, analysing and theorising infrastructures. In Stephen Graham’s (2000) words, ‘infrastructure networks are being reproblematized’ (p. 185). This has come along with establishing a closer relationship across social and technical disciplines and fields. 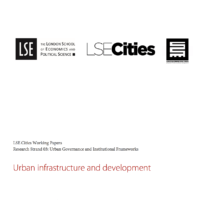 This working paper provides a selective and stylised review of the key and contemporary urban infrastructure debates. The paper’s purpose cuts across two main objectives: first, to establish a point of departure and conceptual framework for the British Academy GCRF Cities & Infrastructure project ‘Governing Infrastructure Interfaces’ led by LSE Cities, the African Centre for Cities and Addis Ababa University; and second, to explore common ground and fault lines between key disciplines involved in this project and to identify new interdisciplinary connections between technocratic and policy-oriented work on the one hand and critical, political perspectives on the other. This working paper is divided into three parts. Part one explores dominant ‘infrastructure ideals’ that have shaped infrastructure discourses and policy over decades. Each idea has both material and institutional arrangements that underpin it. These ideals have shaped policy and thinking over time. Part two explores the tension between technical readings of urban infrastructure and social/political readings of urban infrastructure. As we show, both the technical readings and the social/political readings have struggled to engage with one another in productive ways. In the conclusion, we draw together the technical and the social/political reading, arguing for an approach that can grapple productively and propositionally with both. In addition, we argue that such an approach should be grounded in place and attentive to the emergent disruptive trends on the horizon. Liza Cirolia received her undergraduate degree in Development Studies from the University of California, Berkeley in 2009. She received her MCRP from University of Cape Town in 2011.
Who will plan Africa’s cities?